We took an early lead away from home against DVTK and managed to come away with a win that could mean a lot in the end of the regular season. Medgyessy got the game going with a triple, to which Queralt answered back with a double, and then handed out an assist to Amanda for three. Later on, Mokango put it back under the rim after n offensive rebound (4th minute 5-5). What's more, the hosts even took the lead, but then Aleks tied it back up again. Amanda gave an assist to Dalma, who buried a nice mid-range double, to which Aleks added two more. When Queralt made a lay-up to to get us even further away, L�szl� Czicz�s decided that it was time to talk it over (7th minute 7-13). The home side's effort have proved ineffective, Yvonne came up with another double from the free throw line. We have even managed to increase our lead into the double-digit region, but then Miskolc woke up and reduced the gap all the way down to six points, when Yvonne came up with another double. We closed toe first period with an 8-point lead (10th minute 13-21). The second quarter began quite balanced, but we were always a small step ahead, and when their efforts were met with resistance they called another time-out (13th minute 18-29). Yvonne made two free throws, and then she was fouled during an attempt for three, drawing three more shots from the line. Our head coach got called a technical foul on himself awarding DVTK a single free throw. All of these were successfully converted into points, giving us a fifteen-point advantage (15th minute 19-34). The free throw line remained in the spotlight, Candice hit two more. Finally, a field goal was made, Katona came up with a double. Following that, Roberto Iniguez called a time-out, after which Debi made a nice jumper for two. We were aiming for the twenty-point margin, but DVTK managed to hold us off, for the time being (26-42). Walker-Kimbrough added two more points to her total, forcing our mext time-out. 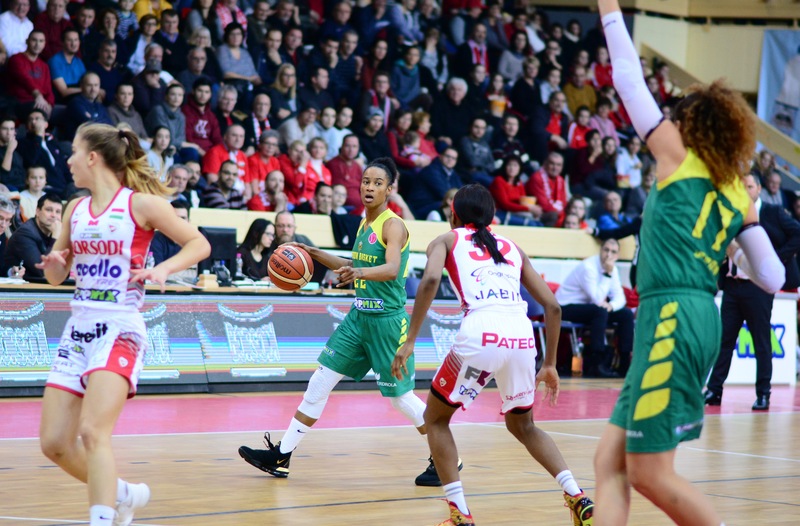 The first half ended with a quick exchange of baskets between Candice and Zele, which resulted in a 14-point advantage halfway through the game (30-44). We began the second half with a 7-3 run which was finished by a huge buzzer-beating triple by Aleks (23rd minute 33-51). To that DVTK answered back with their own 7-2 run forcing our next time-out (40-53). Unfortunately, we couldn't make their momentum go away, Medgyessy was able to score again after the short pause. Putnina was able to make another shot after grabbing countless offensive rebounds, to which Amanda finally answered back with a double of her own, and then Yvonne came up with a double to calm her team down, but Di�sgy�r had the final say in the quarter with a double, reducing the gap to thirteen points (30th minute 46-57). Amanda began the final stage of the game with a nice double off the assist by Yvonne, to which Zs�fi added two more after a great individual effort. Following our next successful offensive play Szab� was finally able to get the home side going in the fourth quarter, to which Amanda answered back with a double off a big assist by Dalma, to which Yvonne added another basket for two, forcing Di�sgy�r's next time-out (36th minute 50-67). Medgyessy went in for a lay-up, to which Queralt answered back likewise, and after that Miskolc came up with a 6-0 run to reduce the gap (58-69). Queralt stopped the home side's run with a spectacular shot from downtown, which later proved to have been the final basket of the game which we ended in possession of a 14-point advantage (40th minute 58-72). 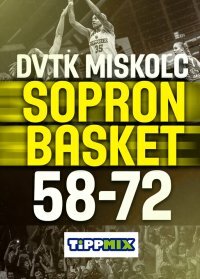 Roberto Iniguez: Congratulations to Miskolc! It is not easy to continue playing after a first half like this. Most teams would have given up, but they kept fighting, and for me that is what shows the real value of a team. You can never give up, you always have to keep going forward! About us: We have some difficulties, and we are in a tough stretch, that requires a lot of energy. We miss Betti, Zs�fi is also not healthy, and Tina has just begun the road to returning. I think we didn't play like we usually do after the break, we focused too much on the result. but it's okay, we have to learn from that, too. Today this performance was enough, but this is an aspect in which we still need to improve. We won the game with a very good first half performance. A crucial game is coming up for us on Wednesday on the home court of Olympiacos, we will do our best to prepare for it! Dalma Czukor: It was a very tough game! Our defense worked well. We got a little confused in the third quarter, but thanks to our good defensive effort good attacking possession came afterwards, and so we were able to best DVTK.